Both the federal government and most state governments seem to be continually tinkering with the eligibility requirements and restrictions. This is why consulting with your elder law attorney is so important. As for home care, Medicaid has traditionally offered very little — except in New York, which provides home care to all Medicaid recipients who need it. Recognizing that home care costs far less than nursing home care, more and more states are providing Medicaid-covered services to those who remain in their homes. It’s possible to qualify for both Medicare and Medicaid. Such recipients are called “dual eligibles.” Medicare beneficiaries who have limited income and resources can get help paying their out-of-pocket medical expenses from their state Medicaid program. ending and will be replaced by Medicaid. Is your family getting the VA support they deserve? Individuals who have risked their lives to serve and protect the United States of America and its citizens are entitled to a variety of benefits through the U.S. Department of Veterans Affairs (VA). Eligibility requirements vary for these benefits, but many veterans (and their family caregivers) are able to receive some level of coverage, financial assistance or support. This guide will help direct veterans and their family members to VA programs that may assist in paying for or providing long-term care, burials, pensions, and other benefits. This guide includes the most up‑to‑date information on getting VA benefits. Request a copy and it will be emailed immediately. AgingCare.com is the go-to destination for family caregivers, providing trusted information, practical answers to real-life questions, and ongoing support. Our mission is to help families prepare for and navigate the care of an elderly loved one. AgingCare.com has been recognized in both national and local media as an expert resource on elder care. AgingCare.com is paid by our participating providers, so we are able to offer you a completely cost-free service with no hidden fees. What effects will repealing Obamacare have on Medicare? What effects can repealing the Affordable Care Act (ACA), aka Obamacare, have? While repealing Obamacare will have implications for millions of younger people covered by the insurance, it will also affect Medicare beneficiaries. Hopefully the best parts will be kept in place if a new plan is enacted. This is why consulting with your elder law attorney is so important. As for home care, Medicaid has traditionally offered very little — except in New York, which provides home care to all Medicaid recipients who need it. Recognizing that home care costs far less than nursing home care, more and more states are providing Medicaid-covered services to those who remain in their homes. It’s possible to qualify for both Medicare and Medicaid. Such recipients are called “dual eligibles.” Medicare beneficiaries who have limited income and resources can get help paying their out-of-pocket medical expenses from their state Medicaid program. For details, click here. The need to protect your assets is always at hand. Planning for long-term care with an elder law attorney can help protect your assets for the in home spouse and heirs. Medicaid Planning or Life Care Planning helps to ensure that you or your loved one get the best possible long-term care and the highest possible quality of life, whether at home, in an assisted living facility, or in a nursing home. The following article brings this issue to light. 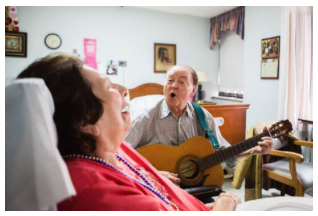 To Collect Debts, Nursing Homes Are Seizing Control Over Patients.